The surfaces between teeth are not easily accessible by a toothbrush. The best way to clean them is by flossing. 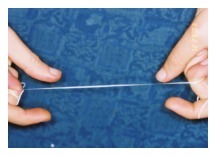 The ideal frequency for flossing is like brushing: ideally after each meal, though one time a day (before going to bed) is the minimum necessary. Your Little Falls, NJ Dentists can answer your questions about how to floss your teeth in for the areas of Little Falls, Cedar Grove, North Caldwell, West Caldwell, Totowa, Wayne, Woodland Park and Lincoln Park. Call 973-256-2222 or Contact Us for an appointment.